Duvet cover can be used separately as a coordinating top sheet, without the duvet. Very complete as it comes with mattress cover, sheets and all you need to start using the crib. I've bought this crib and need extra fitted sheets. Where can I buy those from? Jane UK Replies: Hi Deniz, We don't currently sell these separately, however any crib sheets in the correct size would do. Here are the Bed size dimensions: 50 x 82.5 cm. Hope this helps. Does this crib conform to current British Safety Standards(e.g. BS EN 716)? Jane UK Replies: Hi Laura, Bs En 716 is for bigger cots, the correct regulation for cots that also cover cribs is EN 1130/1-2:1996 which the Jane Babyside crib fully complies with. Hope this helps. The instructions state that the upholstery is removable. What material is the upholstery made of and can it be washed in case of baby being sick on it etc.? 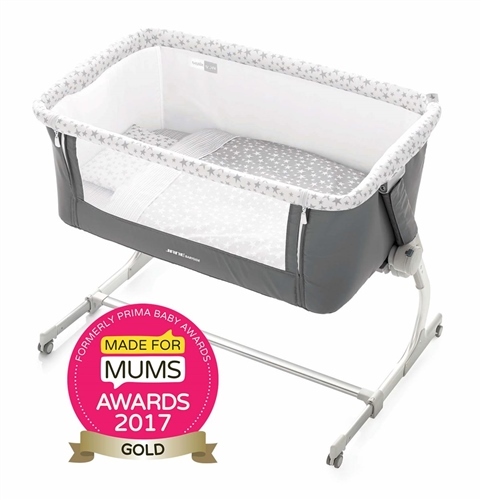 Jane UK Replies: Hi Lorna, If you can check back at the Jané Babyside Crib page on our Jane-uk website, we have updated it to include the technical information you requested. In summary, when the Babyside crib is in its top level 6 position, the recommend corresponding parent bed mattress should be at least 54 cm, with a recommended limit of 64cm. So your bed will work with the Jane Babyside crib. Hope this helps. Is the inside of the crib washable or wipe clean only?